Dissertation: "Molecular and biofunctional modification of conformal POEGMA bottlebrush coatings and applications toward in vitro diagnostics"
Daniel is from Anaheim, California. 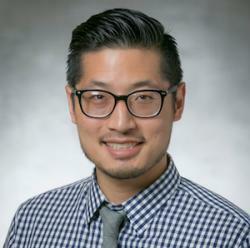 He is an MD-PhD candidate in the Medical Scientist Training Program at Duke. He joined Dr. Chilkoti's Lab (BME) in 2014, and is co-mentored by Dr. Franklin (ECE). Daniel is teamed up with Joey to develop low-cost, fully-printed electronic biosensors that would be used to diagnose disease at "point-of-care". Outside the lab, he enjoys exercise, ping-pong, cooking, attending Franklin Lab Parties, and hanging out with his wife Jane and his dog Perry.